The cheetah is more delicate and lighter framed than other cats, but is a highly specialized class athlete of the cat world. They are daylight hunters, but have been known to hunt by moonlight, although this is rare. (McLaughlin 1970) They rest in the shade in the hottest part of the day. A female cheetah weighs around 50kg but the males being more robust can weigh up to 10kg more. Standing taller than a leopard they differ with longer, slender legs, having small feet armed with blunt unsheathed claws that act as traction when sprinting. The dewclaw is sharp and is used in hunting. They have a long, flexible back, short neck with small rounded head, low broad ears and a long slender tail. The cheetah is tawny in color with white under parts and their spots are small, black and solid. The face has black lips, nose and distinctive tear lines running from eye to mouth. Their sense of smell is acute and eyesight excellent. The specialty of the cheetah is to prey upon the fastest antelope's and gazelles such as impala and Thompson's gazelles and their fawns, which make up a large part of their diet. Infrequently they can kill antelopes heavier than themselves, although this is usually done by a coalition of males. The cheetah’s top speed is 90 - 112kph (60 - 70mph) over short distances of around 300m. The habitat they inhabit is grassland areas with some cover, trees and broken ground and savanna woodlands. Females are solitary except when mating or rearing cubs, whereas males can live alone or in coalitions made up usually of brothers. Both males and females can be territorial. 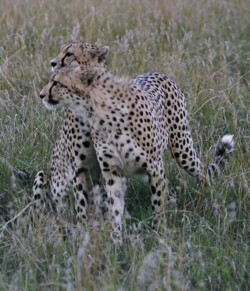 In regions with mainly migratory prey the cheetahs cover a wide range. Where there are sedentary prey herds the cheetah’s range may be much smaller. Males, being territorial will compete for the best hunting grounds and their ranges will overlap those of one or more females. They also may defend areas much smaller than the females. This is the opposite if that seen in most other carnivores. Females alone raise the offspring, having litters of 3 - 5 cubs, after a gestation period of 90 - 95 days. (Frame 1976 and Schaller1972) A cub can weigh 150 - 300g at birth and is completely dependant on the mother. A mother cheetah may move her cubs several times during the first month, for safety and it is rare to see cubs less than one month old. They are extremely vulnerable to predation and there is a high mortality rate. Although a mother will defend her cubs from other predators, even the adults are vulnerable due to their lack of body strength and slight build. They may resist loosing a kill to another predator by growling, hissing, spitting and even mock charging, however they will give in to the larger, stronger lion or hyena. Lions frequently kill cheetahs. The investment a mother cheetah places in the raising of her cubs is great. The skills needed for adulthood take time to learn. Cheetahs are often spotted resting on termite mounds, from where they get better view of the plains and potential prey. 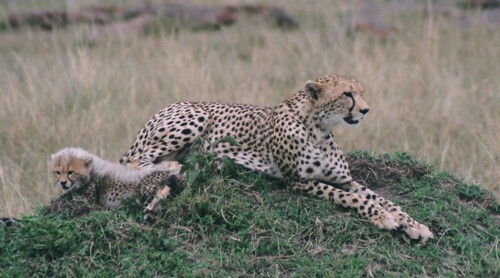 When prey is within 50m - 100m, depending on the terrain type, the cheetah can adopt different hunting styles; simply wait as if uninterested until the prey comes closer, or approach slowly in full view, when within 60 - 70m, after selecting a victim, the cheetah may run at the herd, accelerating to full sprint, at speeds of up to 70mph. 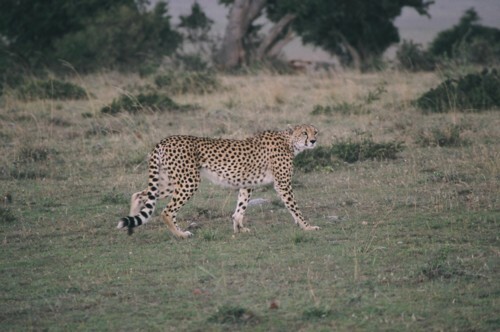 Alternatively, if the herd is grazing oblivious to the cheetah’s presence, the cat may rush at top speed towards the herd from 100m or so, in the hope of getting close enough to select a victim before being spotted. Wherever cover is present cheetahs will choose to stay hidden for as long as possible to reduce the distance between themselves and their prey. The zigzagging and turning of prey is only matched by the supreme abilities of the cheetah to change direction at high speed. Normally if prey is not overtaken within 300m the breathing rate of the cheetah will rise to 150 per minute; far too high to be sustained. The temperature also rises, so much so that the hunt must be abandoned and a shady resting place must be found to recover. The bringing down of the prey is achieved by tripping the prey involving the sharp dewclaw, which is hooked into the back or flank of the prey and pulled backwards. This throws the victim off balance. A secure grip of the windpipe is gained by the cheetah using its legs and chest to hold down the struggling animal. They do drink water when it is available, but in more arid regions they have been known to go for 10 days without drinking. The moisture they get from the blood of their kills is sufficient to sustain them. Vocal communications consist of chirping, yelping, growling, snarling, bleating and purring. The cheetah is much less vocal than other cats, but these communication sounds are used in more close contact with siblings, in maternal calling or in defense. Territoriality is displayed by scent marking and not calling, as with lions and leopards. References: Joy Adamson 1969. Frame GW &LH 1976. Kingdon 1977. McLaughlin 1970. Schaller 1972.